Welcome to the home lighting design section. The lighting scheme of a room can make or break how it feels to live in the space. Deciding on your lighting scheme is an essential part of the home design process because it needs to be thought out and detailed on the detailed design drawings. So here’s a few quick links to what’s on this page and in the rest of the lighting design section of the website. This section aims to break down the art of home lighting into a home lighting design process. If something is a process it can be learned and used again and again. So let’s get started. To start with it may be helpful to have a browse of the lighting symbols page, the lighting techniques page, the ‘Which light bulb?’ page, the lighting calculations page. Or you can get started on the process below and go and take a look at those pages when you need to know more. When you’re faced with lighting a room, don’t be tempted to run out to your nearest lighting store or stick your head into your lighting catalogues. The starting point of the home lighting design process is to look first at what you want to light up, then think about what you’ll light it up with. The first step in deciding what to light is to think about the activities which go on in a room. All design starts with thinking about the activity the design is going to accommodate. For example in a kitchen we prepare food and eat, in the living room we chat and watch TV, in the bedroom we might read and sleep. Each of those activities has items in the home associated with it. For example in the kitchen we light the kitchen top for food preparation and the kitchen table for eating. In the living room we need light so we can see each other faces. In the bedroom we need a light which allows us to read a book. If there’s anything special that’s in the room, such as a painting or sculpture, or an architectural feature that you’d like to highlight with your lighting scheme, put that on the list. In summary, for each room, make a list of the activities and associated items or parts of the home that need to be lit. 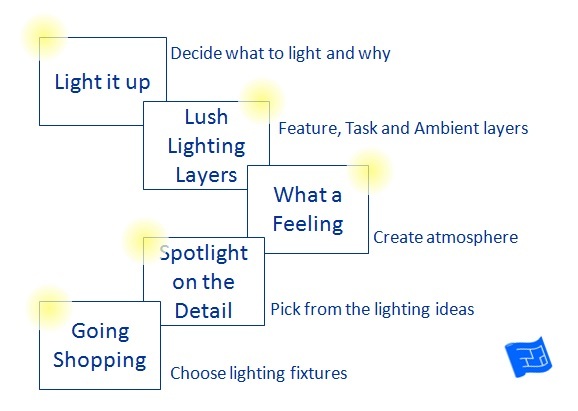 To get you started with this, each room lighting ideas page goes through activity ideas in detail. The ambient lighting layer provides what the eye perceives as the general level of light in a room. Ambient lighting is delivered through the larger lighting fixtures in a room, and don't forget the role of daylight in home lighting design. The task lighting layer which provides light for a specific activity to make the activity easier. Examples are lighting the counter tops in the kitchen for food preparation, or a reading light in the living room. If the ambient lighting in the kitchen or living room is sufficient it may well be possible to prepare food and read without task lighting, but the extra light enhances the experience of chopping or a good novel considerably. I have come across feature lighting referred to as decorative lighting, or accent lighting. my personal favourite, ‘sparkle’. Feature lighting isn’t necessary for any activities in the room, so it's there to add a bit of sparkle to your home lighting design. Examples include lighting up a glass fronted cupboard in the kitchen or lighting up a picture in the living room. The atmosphere that a home lighting design scheme creates is all to do with the interplay between contrasts in light and that are happening in a room and the brightness of light in a room. Contrast has to do with the amount of change from dark to light in a lighting scheme. To make things simple we’ll work with two levels: high contrast and low contrast. You could also think of this as being exciting and calm. High contrast lighting has lots of shadows and changes from light to shadow across the space. Low contrast has very few shadows and the level of light is more or less uniform across the space. Moving on to brightness. Again, to make things simple let’s work with two levels of brightness: strong and soft. These two terms are pretty self explanatory. Strong light is bright light. Soft light is dim light. Now let’s put these ideas of contrast and brightness together and see a few emotional atmospheres that can be created in a home lighting design. Think of a baby’s room at night. Imagine a soft glow throughout the whole room provided by a nightlight. Think of a laundry room during the day. It’s a bight space with lots of reflective surfaces. Imagine a dining room with the table set and lit with a down light on the table and low level lighting on the walls, maybe candles on the side board. It’s hard to think of an example where high contrast can happen in a brightly lit environment so imagine moving from a dark hallway into a conservatory filled with light. Generally each room will have at least two atmospheres, one for day and one for evening. Some rooms may have several different moods that you’re seeking to create based on different activities. It’s fun to try and give them a name. Top of the morning (bright light, low contrast) for the kitchen in the mornings when everyone’s getting ready to go. Kitchen comfort (bright light, high contrast) for when the cooking and clearing away activities are done for the day and it’s time for a cup of tea and a chapter of a book. Kitchen nightclub (low light, high contrast) for the time I installed disco lights and a mirror ball in the kitchen. Did I just admit to that? Dramatic sensuality (soft light, high contrast) for a bedroom at night time. Easy does it (low light, low contrast) for the hallways at night time. Armed with your list of moods that you want to create in your home lighting design, head on over to room lighting ideas page and browse the lighting ideas listed for each room. Le your architect or design professional know what lighting you want in each room because the lighting design plan forms part of the construction drawings. The lighting symbols page will help you understand your lighting design plan. Now it’s time for the lighting catalogs and maybe a visit to your lighting showroom. Take a look at the lighting calculations page and the ‘Which light bulb?’ page to get the knowledge you need to shop for light fixtures effectively.